Key Difference: Apes are a type of primates, which when further broken down into results in gorillas. Gorillas are a subcategory of Apes. Gorillas are considered as the largest ape and part of the Genus, Gorilla. It is often difficult to differentiate between an ape and a gorilla because a gorilla is actually an ape. Apes are a type of primates, which when further broken down into results in gorillas. Let’s look at the bigger picture first. In an attempt to make things easier, scientists use a classification system in order to distinguish different species. Apes belong to the Animalia kingdom, Chordata Phylum, Mammalia Class, Primates Order and Hominoidea Superfamily. Primates were originally divided into two types: Old World and New World monkeys, Apes belong to the Old World tailless category. They are native to Africa and Southeast Asia. Apes include all of the members of the Hominoidea superfamily, excluding the Humans. Now apes can further be divided into two branches: Greater Apes and Lesser Apes. Greater Apes include the orangutans, gorillas and chimpanzees, while Lesser apes include various different species of gibbons. Lesser apes are also highly arboreal and bipedal on the ground. 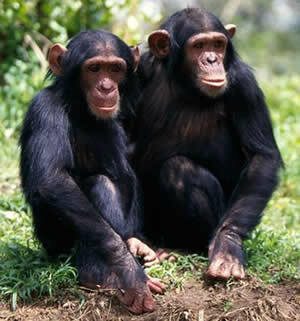 They have lighter bodies and smaller social groups than great apes. The classification of greater apes means that the apes in this category have a more complex brain and higher intelligence. The term ‘ape’ is believed to be derived from the old English word ‘apa’, which was believed to the onomatopoetic imitation of animal chatter. Now the most common classification of apes includes being tailless. If a primate does not have a tail, it is commonly classified as an ape. Apes are usually larger in size and have uneven proportion of hands to legs. Apes have longer hands and a stronger upper body. This is commonly to be able to swing from branch to branch. Apes can stand on their hind legs for a decent period of time but prefer to travel on both, their hands and legs. Apes are considered to have a more developed brain, and the ability to understand many things. Gorillas are considered as the largest ape and part of the Genus, Gorilla. These are ground-dwelling creatures that heavily depend on an herbivorous diet and can be found most commonly in the forests of Central Africa. Gorillas are considered as the next closest living relatives to humans after the chimpanzees, with DNA being 95–99% similar. The closest relatives of gorillas are chimpanzees and humans, all of the Homininae having diverged from a common ancestor about 7 million years ago. Gorillas can weigh upto 180 kg (397 lb) and can even go upto 270 kg (600 lb) in captivity, although considered as obese. The male gorillas are known as silverbacks because of the silver hair on their back that goes up to their hips. Gorillas' natural habitats cover tropical or subtropical forests in Africa. Although their range covers a small percentage of Africa, gorillas cover a wide range of elevations. 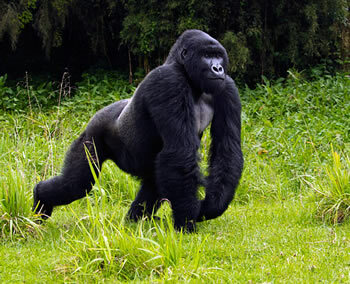 The mountain gorilla inhabits the Albertine Rift montane cloud forests of the Virunga Volcanoes, ranging in altitude from 2,200–4,300 metres (7,200–14,100 ft). Unlike chimpanzees and orangutans, gorillas sleep in nests on the ground rather than the trees. Gorillas live in troops of one adult male and multiple females, and most of their day is divided between resting, traveling and foraging for food. Gorillas face threat from leopards. They are considered as intelligent beings with many gorillas in captivity being taught how to use sign language. Even in natural habitat, gorillas can be seen using tools such as using a stick as if to gauge the depth of water whilst crossing a swamp, using a tree stump as a bridge, etc.